The first annual ITA Fall Championships, which takes the place on the schedule of the ITA Indoor Intercollegiate Championships, begins Wednesday in Indian Wells California. Unlike the Indoor, which featured 32-player singles draws, this draw is 64, but with a Sunday finish, that still requires a day with two singles matches, which will be Friday. The singles round of 16 and quarterfinals were both be played on that day. The ITA preview says live scoring will be available through the Tennis Ticker app and live streaming will be provided for two courts at the Indian Wells Tennis Garden. The second site is the JW Marriott Desert Springs resort. The 16 singles seeds and eight doubles seeds are listed below. The men's singles draw, with times, is here. The men's doubles draw is here. The women's singles draw, with times, is here. The women's doubles draw is here. 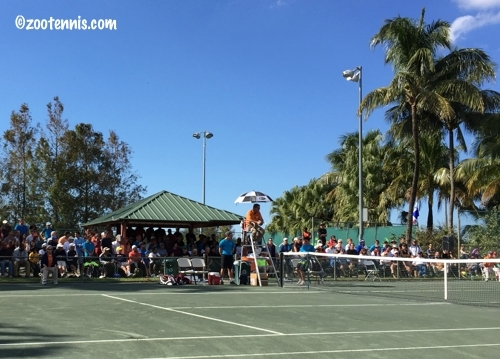 The playoffs to decide which boys and girls from the United States will earn entry into January's Les Petits As are underway at the Club Med in Sandpiper Bay Florida. Competition in four round robin groups will determine the quarterfinalists, with the winner and finalist assured a spot in the main draw in the prestigious 14-and-under event in Tarbes France. The list of those competing and results from the first two days of round robin play can be found at the Les Petits As website. 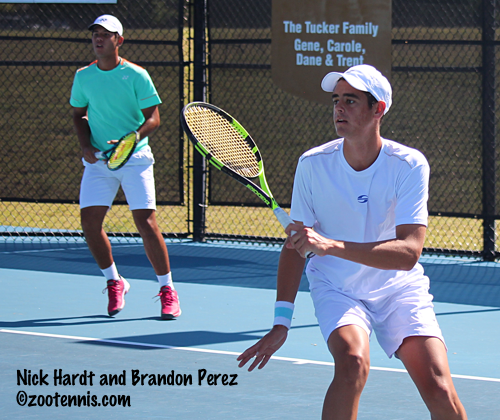 This week's Grade 4 ITF junior circuit event in the United States is in Lexington South Carolina, where top boys seed Tyler Zink has already been eliminated. Zink lost in Monday's first round to Northwestern recruit A Trice Pickens 6-3, 6-7(6), 6-4, with Pickens winning his second round match today. No. 2 seed Stefan Leustian has won two three-set matches to advance to the third round. The top seed in the girls draw, Chloe Beck, has advanced to the third round. The No. 2 seed withdrew and was replaced by a lucky loser. 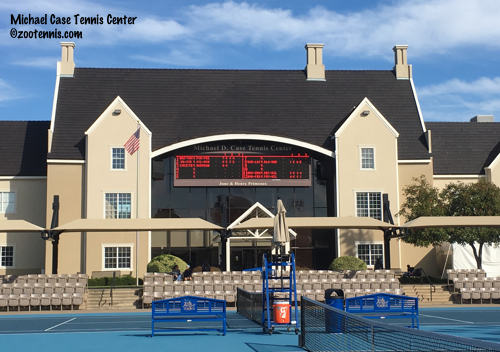 There are three USTA Pro Circuit events this week--a $15,000 Futures in Birmingham Alabama, a $75,000 ATP Challenger in Charlottesville Virginia and an $80,000 women's event in Tyler Texas. The first round in Charlottesville is nearly complete, with top seed Tennys Sandgren defeating defending champion Reilly Opelka 6-3, 6-4 Monday, and No. 2 seed Henri Laaksonen of Switzerland beating Marcos Giron 6-4, 6-4. This is the first event that counts for the men's USTA Australian Open Wild Card Challenge, but unlike the women's WC Challenge, other ATP events around the world are also among those where points can be earned in the next three weeks. This week's Challengers in China and Australia have eligible Americans competing there and earning points. In Birmingham, rain kept the qualifying from finishing on Monday, as is typical, but the main draw did get underway, with Sekou Bangoura and Argentina's Matias Zukas the top two seeds. Wild cards were given to Alabama sophomore Thibault Cancel of France, Alexandre Rotsaert, Sebastian Korda and Patrick Daciek. At the women's tournament in Tyler, qualifying was completed today, with Americans Ashley Kratzer, the USTA National 18s champion, Amanda Rodgers and Caitlin Whoriskey advancing to the main draw. Nicole Gibbs in the top seed, with Taylor Townsend the No. 2 seed. The past two US Open girls champions, Kayla Day and Amanda Anisimova, are in the draw. Day plays Vicky Duval, who received a special exemption after reaching the final of the Macon tournament last week. Duval beat Day in the semifinals in Macon 6-1, 6-3. 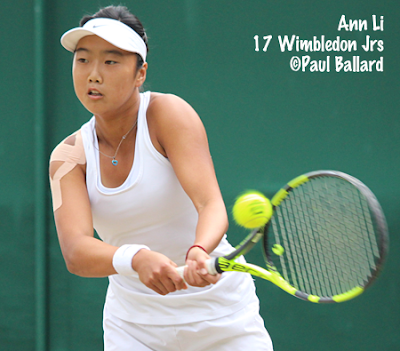 A number of Americans are competing at the $60,000 Women's Pro Circuit event in Toronto, including Wimbledon girls finalist Ann Li, who received a wild card, and Ohio State junior Francesca Di Lorenzo. Li defeated Robin Anderson in the first round, with Di Lorenzo taking out No. 4 seed Bibiane Schoofs of the Netherlands. NEW YORK, October 19, 2017 – Lagardère Sports announced today it has signed elite American junior tennis player Danny Thomas for management and marketing representation. Thomas, who is 17-years old, was born in Tuscaloosa, Alabama and grew up in Columbus, Ohio, where he first picked up a tennis racquet at the age of five. He reached the top 20 in the world on the ITF Junior Circuit before turning pro, and was the youngest American player in the top 20. He also advanced to the Quarterfinal round in the US Open junior tournament last month. Lagardere Sports, the global sports marketing agency, has a rich history in tennis that encompasses several of its key business lines. The agency’s Tennis Division represents several top ranked players for management or marketing representation, highlighted by No. 1 ranked Simona Halep, No. 6 ranked Caroline Wozniacki, Ana Konjuh, and Richard Gasquet on the men’s side. It manages a number of top ATP and WTA tennis events globally, including The Citi Open® in Washington, D.C., the Ski Star Swedish Open, and the BNP Paribas WTA Finals in Singapore. Also, the agency’s Media Division markets the television rights for more than 20 professional tennis tournaments to regions around the world. Jared Donaldson was the guest on the Beyond the Baseline podcast of Sports Illustrated's Jon Wertheim last week, and Wertheim asked him if he regretted not going to college. With Donaldson reaching the ATP Top 50 recently, it was unlikely that the answer would be yes, but Donaldson gave an expansive answer why he turned pro rather than go to college. Having spoken to Donaldson often during that time, I'm not surprised by the thoughtfulness of his answer, which addresses both a player's financial backing and the conflicting motivations that come with playing to win for your team, rather than to improve your personal game. Donaldson, the only American who qualified for the ATP's Next Gen finals, which begins next Tuesday in Milan, discusses why he's looking forward to playing with his peers there, his feelings about the innovations in Milan, his coach Jan-Michael Gambill, how he started playing tennis, and several other topics. WHITE PLAINS, N.Y., October 30 2017 – The USTA today announced the top American collegians selected to represent the U.S. in the annual Master’U BNP Paribas International Collegiate Team Competition November 30-December 3 in Marcq-en-Baroeul, France. Competing for the U.S. are: Ena Shibahara (Soph., UCLA; Rancho Palos Verdes, Calif.), the Intercollegiate Tennis Association’s No. 1-ranked women’s singles player; Ashley Lahey (Soph., Pepperdine; Hawthorne, Calif.), the ITA’s No. 3-ranked women’s singles player; Alle Sanford (Fr., UNC; Westerville, Ohio), women’s singles champion at this fall’s Oracle ITA Masters event; Brandon Holt (Soph., USC; Rolling Hills, Calif.), the ITA’s No. 11-ranked men’s singles player and 2017 Oracle ITA Masters men’s singles champion; Alfredo Perez (Jr., Florida; Miami), the ITA’s No. 7-ranked men’s singles player; and Martin Redlicki (Sr., UCLA; Chicago), a 2017 ITA Men’s All-American Championships singles finalist. Boise State men’s coach Greg Patton and Ohio State women’s coach Melissa Schaub will travel with and coach the team, which will compete against teams from Belgium, China, France, Germany, Great Britain, Ireland and Russia. Last year, Shibahara was a part of the U.S. contingent that won its sixth straight Master’U title and seventh in the last eight years. Past U.S. representatives in the Master’U competition include Steve Johnson, Irina Falconi, Austin Krajicek, Maria Sanchez, Mackenzie McDonald, Danielle Collins and Chris Eubanks. Tennis Magazine, via tennis.com, is running articles on tennis Heroes, and UCLA's men's associate head coach Grant Chen has been featured recently. Chen, who is one of the most energetic and outgoing people I have ever met in my interactions with the tennis community, has already done more with and for tennis than most who have been in the business for many more decades than he has. It's great to see him get some recognition for all he's done, but the article would need to be much longer to cover more than the tip of the iceberg that is Chen's commitment to tennis. Marta Kostyuk of Ukraine and Emil Ruusuvuori of Finland won the ITF Junior Masters Championships today in Chengdu China, with Kostyuk finishing the tournament undefeated and Ruusuvuori avenging two recent losses. Kostyuk, the 15-year-old Australian Open girls champion, defeated Kaja Juvan of Slovenia 6-4, 6-3 and will move to No. 2 in Monday's ITF Junior rankings. 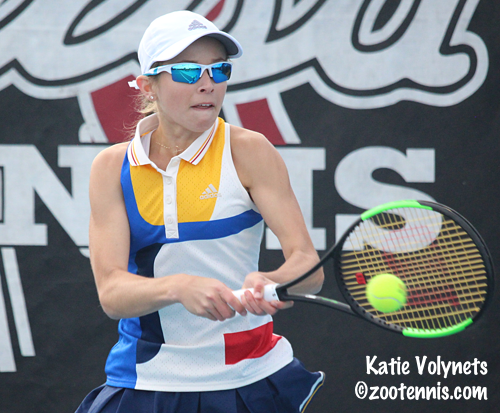 Kostyuk, who beat Juvan in the third day of round robin qualifying, is still behind Whitney Osuigwe, who finished third with a 6-2, 6-2 win over Maria Carle of Argentina. "This week's been great," Osuigwe told the ITF. "I've played pretty good tennis the entire time. Yesterday [against Juvan] I struggled a little bit but today I knew it mattered so I played free and I actually ended up playing really well. So it's been fun here this week." "I think I probably started the week pretty strong," said Osuigwe, whose only loss in five matches was to Juvan. "My best match was my third against Rybakina and today was pretty good too. At this tournament I wanted to learn to better transition into the pros and I've learned a lot from the people here and the WTA people coming in to talk to us." The ITF article about the girls final mentions the two Grade A tournaments remaining, which could give Kostyuk the opportunity to catch Osuigwe in the year-end race for World Junior Champion, but Kostyuk isn't entered in either of them, so she would need wild cards. She did say in New York, after winning the girls doubles title, that she was done with juniors, but that is always subject to change, and at age 15, she is a long way from being able to play as many pro events as she might like. Ruusuvuori defeated ITF World No. 1 and US Open champion Wu Yibing of China 3-6, 6-1, 7-6(4) in the final, a match that was very similar to Wu's semifinal win over Ruusuvuori in New York, which also ended in a third-set tiebreaker. Ruusuvuori had also lost to top seed Wu on the second day of round robin play, but unlike Juvan, the 18-year-old was able to reverse that result in the final. Stanford freshman Axel Geller, the No. 2 seed, finished third with a 6-1, 6-7(9), 6-4 win over fellow Argentine Sebastian Baez. Trent Bryde had been ill during the tournament, which is why he did not compete this weekend. The ITF article about the boys final is here. Elsewhere on the ITF Junior Circuit, 16-year-old Tristan Boyer won his first title at the Grade 2 in Japan. No. 14 seed Boyer, who reached the semifinals of the Osaka Grade A two weeks ago, beat unseeded Kazuki Shimizu of Japan 6-3, 6-3 in the final, and will make his ITF Top 100 debut on Monday. 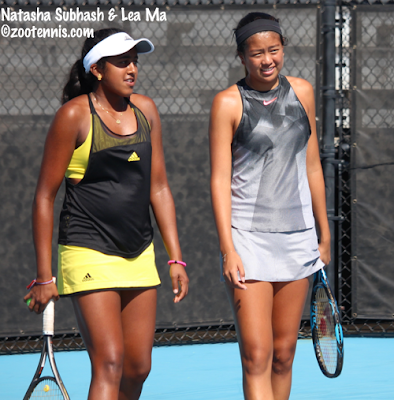 At the Grade 2 in Uruguay, Niluka Madurawe and Shelly Yaloz won the girls doubles title. The unseeded pair, who didn't drop a set all week, defeated the unseeded Japanese team of Natsumi Kawaguchi and Remika Ohashi 6-3, 7-5 in the final. The Grade 4 in Atlanta had its share of weather issues this week, but thanks to indoor courts, it finished today, with 16-year-old Cannon Kingsley earning the boys title, and 15-year-old Savannah Broadus claiming her second singles title of the fall and capturing the doubles title as well. Kingsley, the No. 3 seed, defeated qualifier JJ Mercer, the brother of University of Virginia's Cassie Mercer, 6-1, 6-2 in the final for his second career ITF singles title. Mercer had beaten No. 2 seed Tyler Zink in the quarterfinals. 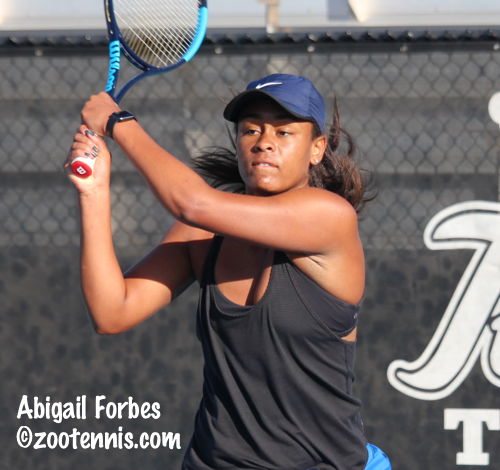 Broadus won the Austin Grade 5 a few weeks ago, but still had to qualify for this week's event, so she was required to win eight matches for the title. Broadus defeated USTA National 16s runner-up Nikki Redelijk, the No. 9 seed, 6-3, 7-5 in the final. Broadus and Sophia Graver, the No. 8 seeds, won the doubles title with a 4-6, 6-3, 10-3 win over No. 7 seeds Maxi Duncan and Elizabeth Stevens. Mercer and his partner Robert Cash won the boys doubles title, beating Phillip Jordan and Andres Martin 7-5, 7-5 in the final. Neither team in the final was seeded; Mercer and Cash finished the tournament without dropping a set. At the Grade 5 in Barbados, 16-year-old Jennifer Gadalov won her second ITF singles title, losing only three games total in her four victories. Gadalov, the No. 1 seed, beat No. 2 seed Sydney Clarke of the Bahamas 6-0, 6-1 in the final. Vicky Duval fell short in today's final of the $80,000 USTA Women's Pro Circuit tournament in Macon Georgia, losing to Anna Karolina Schmiedlova of Slovakia 6-4, 6-1. I hope Duval receives a special exemption or wild card into next week's $80,000 event in Tyler Texas, the second of three tournaments that will determine the USTA's Australian Open wild card. She is now the leader, with the best two results counting. Kaitlyn Christian and Sabrina Santamaria, the 2013 NCAA champions while at USC, won the Macon doubles title, beating Sanaz Marand and Brazil's Paula Goncalves 6-1, 6-0 in the final. Christian and Santamaria have won a pro title together before, back in 2013, but that was at the $10,000 level. Christian won a $60,000 title with former teammate Giuliana Olmos earlier this month; Santamaria's biggest doubles title before this one was at the $25,000 level. At the $75,000 ATP Challenger in China, Miomir Kecmanovic of Serbia completed his impressive run with a title, beating No. 3 seed Radu Albot of Moldova 6-4, 6-4. The 18-year-old 2016 ITF World Junior Champion didn't drop a set all week, and beat four seeds en route to his first Challenger title. He will now make the Australian Open qualifying with a current ATP ranking of 209. The finals are set for the ITF Junior Masters in Chengdu China, with both championship contests rematches from earlier round robin play. Australian Open girls champion Marta Kostyuk of Ukraine, the No. 2 seed, will face Kaja Juvan of Slovenia for the title, with Kostyuk having won their meeting in the final round robin match Friday 6-2, 7-6(1). In Saturday's semifinal, Kostyuk defeated Maria Carle of Argentina 6-3, 7-5 and Juvan took out top seed Whitney Osuigwe 7-5, 6-1. Juvan, who had beaten Osuigwe in the semifinals en route to last year's Orange Bowl title, won the European Championships this year, beating Kostyuk in the final. Juvan will turn 17 next month; Kostyuk is the youngest player in the field; she will not turn 16 until next June. 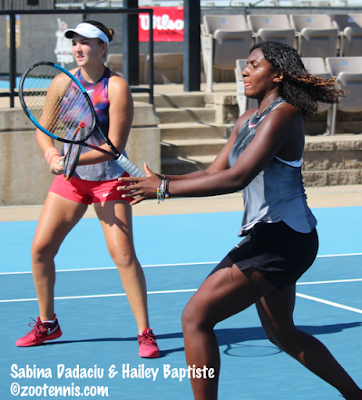 For more on the girls semifinals, including comments from Osuigwe on her loss, see the article on the ITF junior website. Although three players from Argentina reached the semifinals, none will be playing for a title Sunday, with both boys falling today. No. 2 seed Axel Geller lost to Emil Ruusuvuori of Finland 6-2, 6-4 and Sebastian Baez fell to top seed Wu Yibing of China 6-3, 6-2. Ruusuvuori and Wu met in round robin play on Thursday, with Wu posting a 7-6(7), 6-4 win. 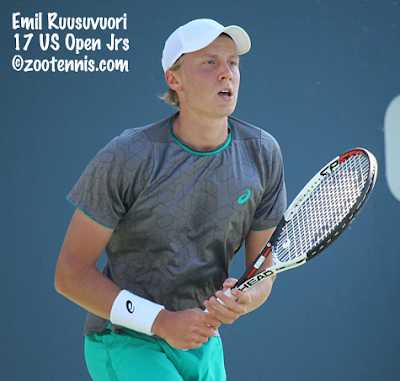 Ruusuvuori came much closer to beating Wu last month at the US Open Junior Championships, with Wu saving two match points to defeat Ruusuvuori 4-6, 6-3, 7-6(4). Wu went on to beat Geller in the final in New York. Ruusuvuori is the only one of the four finalists that has not won a Grade A. The 18-year-old did not play his first ITF Grade A tournament until this year's Australian Open, where he made the quarterfinals. He lost in the first round at the French and Wimbledon Junior Championships. Live scoring and live streaming links can be found on the ITF Junior Circuit home page. Vicky Duval has reached her second USTA Pro Circuit final of this fall and the biggest final of her career at the $80,000 tournament in Macon Georgia. Duval, who turns 22 next month, defeated defending champion Kayla Day, the No. 8 seed, 6-1, 6-3, coming from 3-1 down in the second set to close out the victory. Duval, who will take the lead in the USTA Australian Open Wild Card Challenge with two more tournaments to go, plays Anna Karolina Schmiedlova of Slovakia in the final. Schmiedlova, who was in the WTA Top 30 at the beginning of last year, beat Rebecca Peterson of Sweden 6-3, 6-4. Live streaming is available at usta.com, with Ken Thomas of radiotennis.com providing the commentary. It's great to see one of the best collegiate doubles teams of all time reunited, with Kaitlyn Christian and Sabrina Santamaria into the doubles final in Macon. USC's 2013 NCAA champions, seeded No. 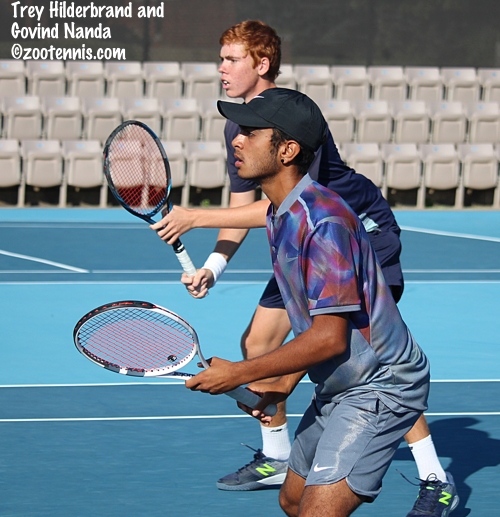 4, will face the unseeded team of Sanaz Marand and Brazil's Paul Goncalves in Sunday's final. 2016 ITF World Junior Champion Miomir Kecmanovic has not played a junior event since the French Open, concentrating instead on improving his ATP ranking. Now into the Top 300, the 18-year-old from Serbia has reached his first ATP Challenger final at this week's $75,000 tournament in Suzhou China. Unseeded, Kecmanovic has yet to drop a set while eliminating three seeds. He will face another, No. 3 seed Radu Albot of Moldova, in the final and would be certain to make the Australian Open qualifying draw with a victory. The round robin stage of the ITF Junior Masters in Chengdu China is complete, with the top two seeds in the both the boys and girls fields advancing to the knockout round. No. 1 seed Whitney Osuigwe moved into the semifinals by finishing 3-0 in her group. The 15-year-old French Open girls champion defeated Elena Rybakina of Russia 6-3, 6-4, a win that put Maria Carle of Argentina through to the semifinals with a 2-1 record. No. 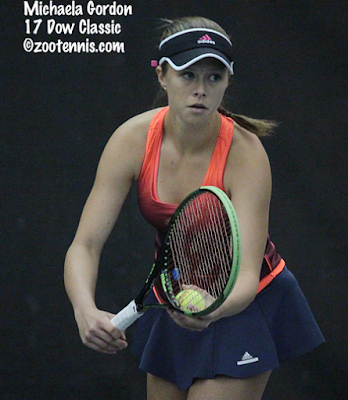 2 seed Marta Kostyuk of Ukraine also went 3-0 in the round robin play, beating Kaja Juvan of Slovenia 6-2, 7-6(1). Juvan also advanced to the semifinals, finishing second in the group with a 2-1 record. Live streaming and live scoring links are available at the ITF Junior Circuit home page. The ITF article on the girls matches is here. In addition to Carle, Argentina has two more semifinalists, with Axel Geller and Sebastian Baez reaching the knockout round with wins today. Geller, the No. 2 seed, had to beat Hsu Yu Hsiou of Taiwan, his partner in winning the Wimbledon doubles title this summer, in straight sets to advance, and the Stanford freshman met that standard with a 6-3, 6-2 victory. Baez, who beat Geller in straight sets on the first day, needed a straight-sets win too, and he got it when Trent Bryde retired. No. 1 seed Wu Yibing of China had already clinched his place in the semifinals, and he lost, meaning that none of the boys went undefeated in their group. Emil Ruusuvuori of Finland is the other semifinalist. Sebastian Baez(ARG) def. Trent Bryde(USA) 6-4, 4-1, ret. The article on the boys final round robin action is here. At the $80,000 USTA Women's Pro Circuit event in Macon Georgia, defending champion Kayla Day and wild card Vicky Duval will meet in Saturday's semifinals, with the winner taking the lead in the USTA's Australian Open Wild Card Challenge. No. 8 seed Day, who won the AO wild card last year primarily due to her title in Macon, beat Jamie Loeb 6-1, 6-4 in Friday's quarterfinals, while Duval took out Ajla Tomljanovic of Australia 6-4, 1-6, 6-4. The top half semifinal features Rebecca Peterson of Sweden and Anna Karolina Schmiedlova of Slovakia. The ITA's National Fall Championships begin next Wednesday in Indian Wells, and the fields are now set, with the at-large players and wild cards announced. The men's ITA wild cards went to Ohio State's JJ Wolf, whose run to the title at the Harlingen Futures kept him from playing the Midwest Regional, and Mississippi State's Nuno Borges, who has a preseason ranking of No. 2. The Oracle wild card was given to Baylor's Bjoern Peterson. North Carolina's Will Blumberg, the ITA All-American champion, is not in the field; he told me in Tulsa that he might not play in the Fall Championships, with the Charlottesville Challenger scheduled for the same week. Ohio State's Mikael Torpegaard also qualified, but is not playing. The women's ITA wild cards were given to Kate Fahey of Michigan, No. 6 in the preseason rankings, and Eleni Christofi of Georgia, No. 10. The Oracle wild card went to Theresa Van Zyl of Baylor. The complete list of competitors is available at the ITA website. Bobby Knight has more on the selections and the official criteria for receiving an at-large entry at College Tennis Today. While I was in Tulsa for the ITF Grade B1 Pan American Closed, I had an opportunity to talk to blue chip Andrew Fenty about his verbal commitment to the University of Michigan. 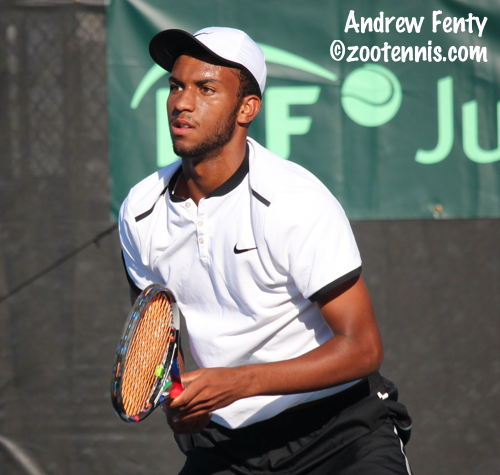 My article on Fenty, who went on to win his first Grade 1 title in Tulsa several days later, is available now at the Tennis Recruiting Network. 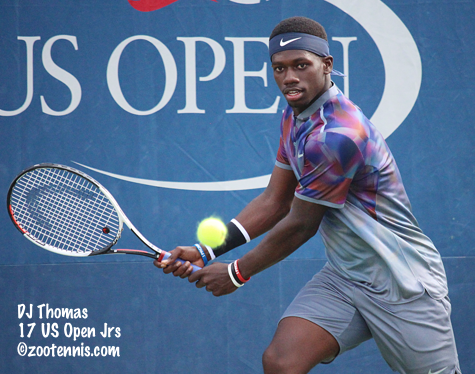 I've watched both Fenty and fellow Junior Tennis Champions Center student Frances Tiafoe play tennis since they were 11 or 12 years old, so it seems a little strange when I hear the 19-year-old Tiafoe is now giving advice, but he did provide the 17-year-old Fenty with a tip about ITF play that Fenty is now passing along to others. The acceptances are out for the Grade A Orange Bowl, which runs from December 4-10 at the Veltri Tennis Center in Plantation Florida. 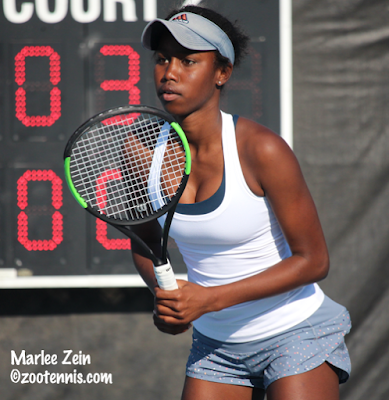 Twelve US girls and nine US boys received entry into the main draws of the last significant ITF junior tournament of 2017. The girls field features two Top 10 players: ITF No. 1 Whitney Osuigwe, who reached the semifinals at the Orange Bowl last year, and No. 7 Carson Branstine of Canada. Thirteen-year-old US Open girls finalist Coco Gauff, who has not played since her incredible run in New York, is entered; she also may play the Eddie Herr, with those acceptances coming out next week. The girls field is quite deep, with an initial cutoff of 98. The boys field has just one Top 10 player: No. 8 Timofey Skatov of Russia, with the ranking cutoff 148. The acceptances were also released for the Grade 1 Yucatan Cup, which runs from November 20-25. Because the Grade 1s are sandwiched between two Grade As and are four consecutive weeks (including Thanksgiving), it's unusual for a player to compete in all four, even if they enter all four initially, although Kayla Day did play all four in 2015, winning Yucatan and reaching the Orange Bowl final. The second day of round robin play at the ITF Junior Masters in China produced many more close matches than the first day did. Top girls seed Whitney Osuigwe defeated Sofia Sewing to go 2-0, with Sewing falling to 0-2. Trent Bryde lost to Stanford freshman Axel Geller of Argentina to fall to 0-2. The third and final day of round robin play is Friday, with the top two finishers in each group advancing to the semifinals. I believe Marta Kostyuk and Kaja Juvan have already secured their places in the semifinals, but they will play for first place on Friday. Kostyuk won their first round meeting at Wimbledon; Juvan won their meeting in the final of the European Championships just a few weeks later. The ITF article on the girls matches features comments from Osuigwe; the ITF article on the boys matches features comments from Geller. The live scoring link is available at the ITF Junior website home page. The first day of round robin play at the ITF Junior Masters in China ended with Americans going 1-2. Top seed and ITF World No. 1 Whitney Osuigwe defeated Maria Carle of Argentina 6-2, 6-4, while Sofia Sewing, also in Osuigwe's group, fell to Russia's Elena Rybakina 6-2, 6-1. Trent Bryde, the only US boy in the field, lost his first round match to Hsu Yu Hsiou of Taiwan 6-3, 6-1. There were not many close matches on the first day, but No. 2 seed Axel Geller of Argentina, the Stanford freshman, lost one, to Sebastian Baez, also of Argentina. Wednesday's results are below. The ITF Junior website has quotes from Osuigwe in its article on the girls, and the article on the boys matches mentions a 142 mph serve by Geller. The girls article also mentions that the reason for Taylor Johnson's withdrawal was a shoulder injury. A link to live scoring is available on the ITF home page; live streaming should be available Friday. This week's USTA Pro Circuit features just one tournament, the $80,000 Women's event in Macon Georgia, which is the first of three tournaments that will decide the USTA's Australian Open wild card. Seventeen-year-old qualifier Ann Li got the biggest win in her limited pro experience, beating No. 7 seed Taylor Townsend 3-6, 7-6(2), 7-5. The LSU recruit, who reached the Wimbledon girls final this year, served for the match at 5-3, had a match point with Townsend serving at 4-5 but didn't convert. She held for 6-5 and broke at 15-40 to end Townsend's 10 match winning streak, which included a 6-1, 6-2 win over Li last week in the first round of the $25,000 tournament in Florence. It's Li's first win on the ITF Professional circuit above the $15,000 level. Also notable was USTA National 18 champion Ashley Kratzer's 6-4, 6-1 win over No. 2 seed and WTA No. 93 Kateryna Bondarenko of Ukraine. 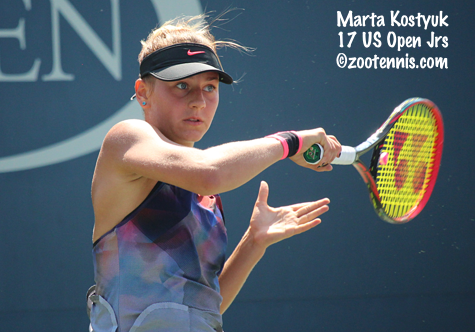 It was the first Top 100 win for the 18-year-old Kratzer, also a qualifier, whose only other match against at Top 100 player was a 6-1, 6-1 first round loss to Tatjana Maria of Germany at this year's US Open. Danielle Collins, the 2014 and 2016 NCAA champion, beat 2012 and 2013 NCAA champion Nicole Gibbs, the No. 3 seed, 3-6, 6-3, 6-2. Top seed Francesca Schiavone of Italy and No. 8 seed and defending champion Kayla Day are the only two seeds remaining after the completion of the first round. At the $60,000 ITF Women's Pro Circuit tournament in Canada, Francesca Di Lorenzo earned her first Top 100 win, taking out WTA 96 and top seed Riza Ozaki of Japan 6-3, 6-3 in the first round. The Ohio State junior, who was still considering a return to school for the dual match season this spring when I spoke to her during the ACI in New York, will face Tara Moore of Great Britain in the second round. Maria Mateas, who has committed to Duke if she doesn't turn pro, defeated No. 8 seed Ysaline Bonaventure of Belgium 6-7(5), 6-4, 7-5. No. 2 seed Bianca Andreescu, who recently signed an management contract with Octagon, lost to former ITF World Junior No. 1 Shilin Xu of China, a qualifier, 7-5, 0-6, 7-5(3). Katarina Adamovic, an All-American at Oklahoma State who completed her tennis eligibility this past spring, has received a scholarship and will be a member of the women's basketball team in Stillwater this winter as she finishes her degree. This feature about the 24-year-old from Serbia, who is 5-foot-8, implies that she will not be playing much, but it's always impressive when a student-athlete competes on the Division I level in two sports. The ITA's Division I Regional Championships were completed today, with the results of all the finals below. Seven of the tournaments were held last weekend, with the 14 finishing today, with all 24 finalists advancing to the Oracle National Fall Championships, beginning next Wednesday in Indian Wells, California. As is the case every year, the Regionals produce some unlikely champions and also some excellent performances from freshmen who, until this tournament have had little opportunity to compete against the best. The ITA results page has links to recaps from most of the individual schools' websites. Three of the women's singles finals and three of the men's singles finals were between teammates, with the Texas, Stanford and Pepperdine women meeting for the titles, as did the Georgia, Michigan and Mississippi State men. For some reason, five of those six matches were played, but the Mississippi State match wasn't. Those that have now qualified for the Fall Championships, including the small college champions, are listed on the ITA website. The at-large selections and wild cards have not yet been released. Below are all the singles and doubles finals results. Those Regionals that were last weekend are in italics. Maryna Veksler and Ulyana Grib, Florida International def. Paige Hourigan and Kenya Jones, Georgia Tech 8-5 (I don't know why pro sets were played throughout tournament at this regional). Felix Corwin and Matic Spec, Minnesota def. Artur Dubinski and Eleftherios Theodorou, Oklahoma State 6-3, 4-6, 10-6. Georgia Tech senior Christopher Eubanks announced today that he was foregoing his final year of collegiate eligibility to pursue a career in professional tennis. The 21-year-old from Atlanta, currently 309 in the ATP rankings, was taking the fall off while he decided whether to return to Georgia Tech for his final dual match season. 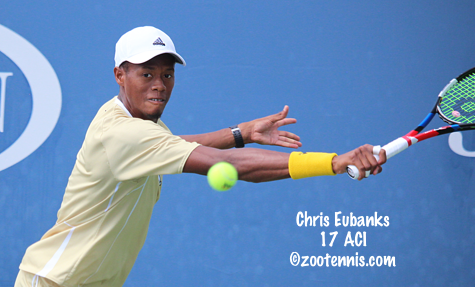 When I spoke to Eubanks in New York, after the American Collegiate Invitational, he said he had 24 or 25 more credits to take before graduating. Eubanks went 31-6 last year, reaching the NCAA quarterfinals and was twice a semifinalist at the National Indoor Intercollegiate Championships in New York. For comments from Eubanks and Georgia Tech head coach Kenny Thorne, see this article from the Georgia Tech website. In a separate article, Eubanks conveys his thanks to those who have assisted him as a student-athlete. The ITF Junior Masters begins Wednesday (tomorrow night here in the U.S.) with the round robin groups revealed today. I hadn't noticed that American Taylor Johnson was no longer in the field, but apparently she withdrew some time ago, with Maria Osorio Serrano of Colombia replacing her. That was revealed in this ITF article about Osorio, just two days after the Johnson article was posted. (There's a mistake in the Osorio article where it claims she is the youngest player in the field. 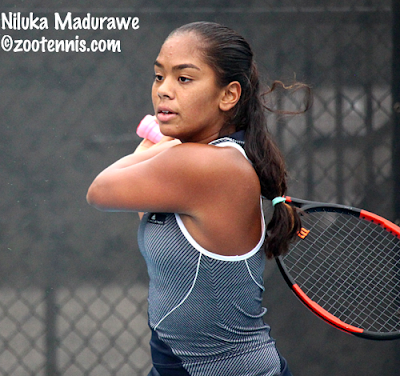 She is older than both Whitney Osuigwe and Marta Kostyuk, although all three are 15 right now). The top two players in each group advance to the semifinals. 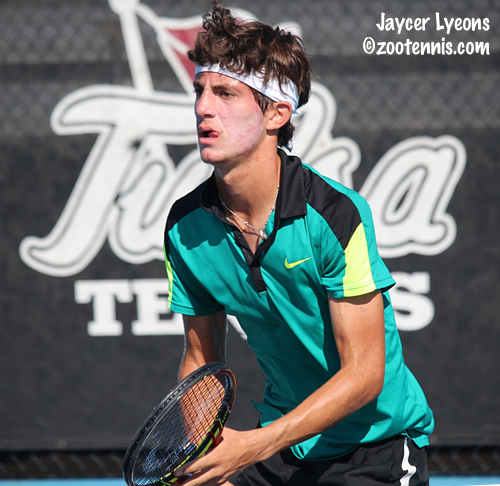 The ITF tournament preview is available here. The ITF Junior Circuit resumes in the United States this week with a Grade 4 in Atlanta. Rain sent the girls first round of singles indoors today, with the boys scheduled to play their first round of singles on Tuesday. I don't know if they will play through Sunday now, or double up later in the week. Top girls seeds Addison Guevara and Tara Malik advanced, with No. 4 seed Sofia Rojas the highest seed eliminated. She lost to qualifier Nikita Vishwase 6-3, 4-6, 6-0. The top seed in the boys draw is Vikash Singh of India, with Tyler Zink the No. 2 seed. The New York Times' David Waldstein has an update on 19-year-old Tornado Alicia Black and her quest to resume her tennis career, which had been derailed by a need for hip surgery, which she could not afford. A gofundme campaign and two large personal donations have resulted in the funds necessary to have the surgery and pay her expenses while recovering. She will not be able to coach, her current source of income, during her rehabilitation. For more on Black's immediate and long term plans, read the article. Ohio State sophomore JJ Wolf may have missed his opportunity for the ITA Midwest Regional Championships this weekend, but the 2017 Kalamazoo 18s finalist more than made up for it by winning his first USTA Pro Circuit title at the $25,000 Futures in Harlingen Texas. For the second consecutive day, the 18-year-old from Cincinnati dropped the first set, but fought back, with the wild card defeating qualifier Evan Zhu, a 19-year-old UCLA sophomore, 6-7(1), 6-1, 6-2 in the final. Unseeded twins Hunter and Yates Johnson(SMU) won the doubles title in Harlingen, beating former Texas A&M teammates Harrison Adams and Shane Vinsant, the No. 3 seeds, 7-6(2), 6-3. It's the fourth Pro Circuit title for the 23-year-old Johnsons together. Yates has a fifth title, with Adams as his partner. For the second straight week, Taylor Townsend swept the titles at a $25,000 USTA Pro Circuit event in South Carolina. A week after taking the singles and doubles titles at the Sumter tournament, top seed Townsend won her fourth title in eight days in the singles final at Florence, beating No. 8 seed Ysaline Bonaventure of Belgium 6-1, 7-5. Townsend won the doubles title with Maria Sanchez yesterday. 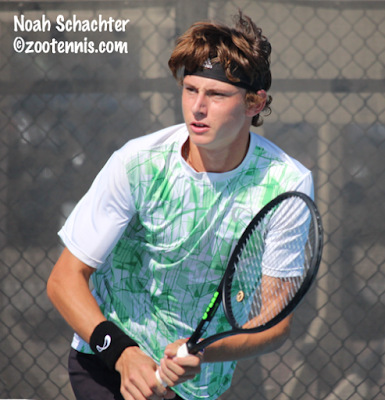 Another Kalamazoo 18s finalist won a title today, with 2015 runner-up Stefan Kozlov taking his second ATP Challenger title at the $50,000 event in Las Vegas. The 19-year-old fourth seed defeated unseeded Liam Broady of Great Britain 3-6, 7-5, 6-4, despite failing to convert two match points serving for it at 5-3 40-15 in the third set. Top seeds Brydan Klein and Joe Salisbury(Memphis) of Great Britain won the doubles title in Las Vegas, beating No. 3 seeds Hans Hach Verdugo(Abilene Christian) of Mexico and Dennis Novikov(UCLA) 6-3, 4-6, 10-3. For more on Kozlov's win in the final, see this article from tournament press aide Steve Pratt. At the €43,000 ATP Challenger in his home country of Germany, former USC star Yannick Hanfmann won his first title at that level, with the No. 3 seed beating unseeded Lorenzo Sonego of Italy 6-4, 3-6, 7-5 in the final. Hanfmann will move to an ATP career high of 114 with the title. The ITF Grade A Osaka Mayor's Cup in Japan is complete, with top seed Whitney Osuigwe falling to No. 2 seed Xin Yu Wang of China 6-4, 6-4 in the final. Top boys seed Yuta Shimizu of Japan won the boys title, beating No. 2 seed Timofey Skatov of Russia 6-3, 7-6(5). I believe the boys doubles title went to No. 8 seeds Admir Kalender of Croatia and Valentin Royer of France, who beat No. 3 seeds Jaimee Angele of France and Nicolas Mejia of Colombia 7-6(4), 4-6, 10-4. That result is not entirely clear, with the ITF recap of the final day giving Angele and Mejia as the champions. Americans swept the titles at the ITF Grade 5 in Bermuda this week, with 15-year-old Andrew Dale claiming his second singles title in two weeks. 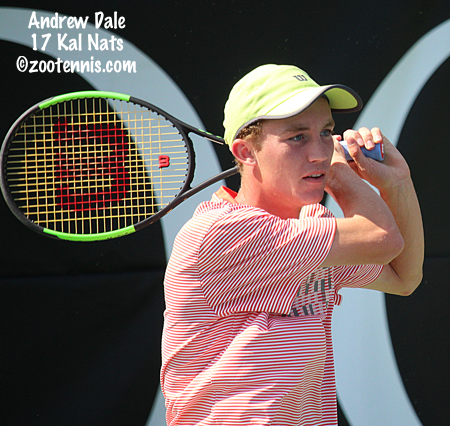 Dale, who opted for Grade 5s in the Dominican Republic and Bermuda instead of playing the Grade B1 in Tulsa, has earned 60 points from singles titles these past two weeks; he would have needed to reach the quarterfinals of the Pan American Closed to earn that amount in that tournament. Dale, the No. 5 seed, lost his first set in his winning streak in the final, beating No. 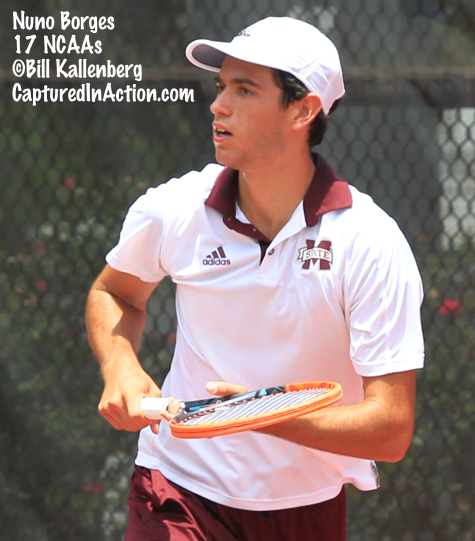 1 seed Alexander Kiefer 6-3, 6-7(0), 6-3 in the all-American final. Marcella Cruz won the girls title, with the No. 4 seed needing to win just four matches, with only 13 girls in the main draw (Dale also won just four matches, due to a bye). The 17-year-old won her first ITF singles title with a 7-5, 6-2 decision over No. 2 seed Annali Olivelle of Great Britain. Cruz also won the doubles title, with Nicole Hammond, needing just two win for that championship. The top seeds beat No. 2 seeds Olivell and Charlotte Russell of Great Britain 6-2, 6-3 in the final. The boys title went to top seeds Kiefer and Jeffrey Fradkin, who beat No. 3 seeds Dale and Benjamin Kittay 6-3, 6-4 in the final. 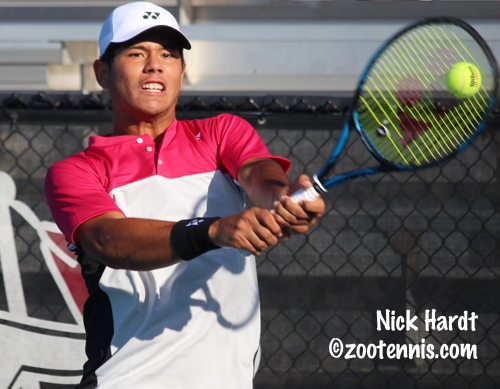 Qualifier Evan Zhu and wild card JJ Wolf will meet for the singles title Sunday at the $25,000 Futures in Harlingen Texas, after both staged impressive comebacks in Saturday's semifinal matches. The 18-year-old Wolf, a sophomore at Ohio State, trailed qualifier Strong Kirchheimer, a recent Northwestern graduate, 6-3, 5-2 before reversing his fortunes for a3-6, 7-5, 6-2 victory. Kirchheimer had played a four-hour singles match on Thursday, so winning a straight sets was almost a necessity for him. Wolf, who earned his first ATP points just last month at the Columbus Challenger, is missing the Midwest Regional this week, where he was the top seed. Zhu, who reached the final of a $10,000 California Futures last year fall, trailed No. 5 seed Luke Bambridge of Great Britain 6-3, 4-2 before rebounding top post a 3-6, 7-6(5), 6-2 win. 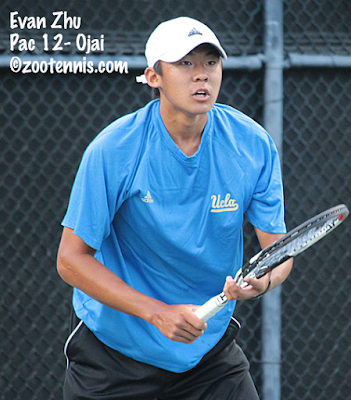 Zhu is taking the fall off from UCLA after playing the spring season, mostly at line 3, this year. At the $25,000 Women's Pro Circuit event in Florence South Carolina, top seed Taylor Townsend saved a match point to defeat No. 3 seed Danielle Collins 6-1, 4-6, 7-6(6) and will play for her second consecutive title on Sunday against Belgium's Ysaline Bonaventure. Collins broke at 5-all and served for the match at 6-5 in the third, but didn't earn a match point until the tiebreaker. Townsend won the first five points of the tiebreaker, Collins won the next six to get to match point, but Townsend took the last three to claim the 2-hour 24-minute victory. Bonaventure, the No. 8 seed, defeated No. 4 seed Rebecca Peterson of Sweden 6-2, 6-2. Townsend and Maria Sanchez, the No. 1 seeds, won the doubles title, beating No. 4 seeds Tara Moore of Great Britain and Amra Sadikovic of Switzerland 6-1, 6-2. It's Townsend's 14th pro doubles title and second in as many weeks. Sanchez now has 20 pro doubles titles since graduating from USC in 2012. At the $50,000+Hospitality Challenger in Las Vegas, 19-year-old Stefan Kozlov defeated top seed Tennys Sandgren 6-3, 7-6(6) to advance to his fifth career Challenger final. He will be going for his second title against Great Britain's unseeded Liam Broady, who defeated Evan King 6-4, 7-5. Top Whitney Osuigwe has reached the final at the ITF Grade A Osaka Mayor's Cup against No. 2 seed Xin Yu Wang of China. Osuigwe defeated Qinwen Zheng of China 7-6(0), 6-2 in the quarterfinals, then got a walkover from No. 3 seed En Shuo Liang of Taiwan in the second match of the day. The No. 1 and 2 seeds will also play for the boys title, with top seed Yuta Shimizu of Japan facing No. 2 seed Timofey Skatov of Russia. Shimizu ended unseeded Tristan Boyer's run in the semifinals 7-5, 7-6(3). The girls doubles championship went to unseeded Sohyun Park of Korea and Himari Sator of Japan, who received a walkover from No. 3 seeds Pei Hsuan Chen of Taiwan and Xiyu Wang of China. The WTA announced its year-end awards yesterday, with 18-year-old CiCi Bellis receiving Newcomer of the Year accolades. 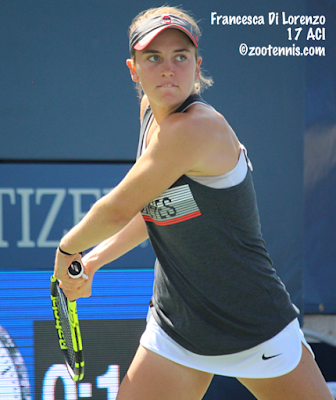 Bellis, the 2014 ITF World Junior Champion, is currently ranked 44 in the WTA rankings. For more on her accomplishments this year, see the WTA's announcement. US Open champion Sloane Stephens was named Comeback Player of the Year. College sophomores Evan Zhu of UCLA and JJ Wolf of Ohio State have advanced to the semifinals of this week's $25,000 Futures in Harlingen Texas. Zhu, a qualifier, beat top seed Nik Scholtz, the former Ole Miss star from South Africa, in Thursday's second round. Today the 19-year-old advanced to his second career Futures semifinal with a come-from-behind 4-6, 6-3, 6-4 win over French Open boys champion Alexei Popyrin of Australia. Zhu, who is taking the fall off, but is expected to return to UCLA in the spring, will face No. 5 seed Luke Bambridge of Great Britain, who defeated No. 4 seed Ryan Shane 7-6(7), 7-5. 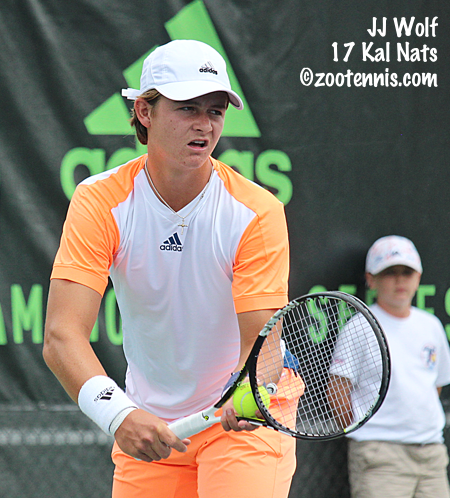 The 18-year-old Wolf, a wild card, earned his first Futures semifinal appearance with a 6-3, 6-2 victory over No. 7 seed Ulises Blanch. The 2017 Kalamazoo finalist earned his first ATP points last month, at the Columbus Challenger, and had played very little at the Futures level until now. Wolf will play qualifier Strong Kirchheimer, the 22-year-old Northwestern graduate, who outlasted 36-year-old Ryan Haviland(Stanford) 6-7(5), 7-6(2), 6-4 in a match that lasted four hours and 16 minutes. Wolf's match today took an hour and eight minutes to complete. while Collins beat No. 7 seed Amra Sadikovic of Switzerland 6-4, 6-3. 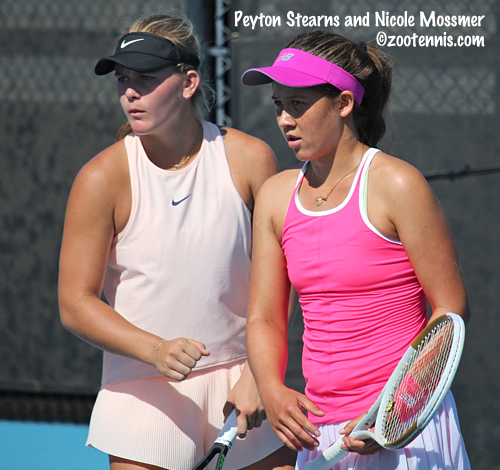 Townsend won their previous Pro Circuit meeting last year in Scottsdale 6-4, 3-6, 6-3. The other semifinal will feature No. 4 seed Rebecca Peterson of Sweden against No. 8 seed Ysaline Bonaventure of Belgium. Three Americans are through to the semifinals at the $50,000 Las Vegas Challenger, again guaranteeing an American in the final, with No. 1 seed Tennys Sandgren facing No. 4 seed Stefan Kozlov Saturday. Sandgren defeated qualifier Jan Choinski of Germany 6-1, 6-0 and Kozlov beat Kevin King 6-2, 6-3. In the bottom half, Evan King defeated Bradley Klahn 7-6(7), 7-6(6) to reach his first Challenger level semifinal; the 25-year-old Michigan graduate had been 0-6 in Challenger quarterfinals until today's win. King will play Great Britain's Liam Broady, who beat No. 8 seed Reilly Opelka 6-7(2), 7-6(5), 6-4. 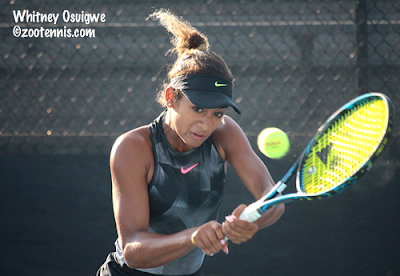 Rain has delayed the singles quarterfinals of the ITF Grade A Osaka Mayor's Cup in Japan, with top seed Whitney Osuigwe and Tristan Boyer the Americans still alive in singles. The schedule has two rounds of play indoors on Saturday, with no-ad scoring and a match tiebreaker as the format. 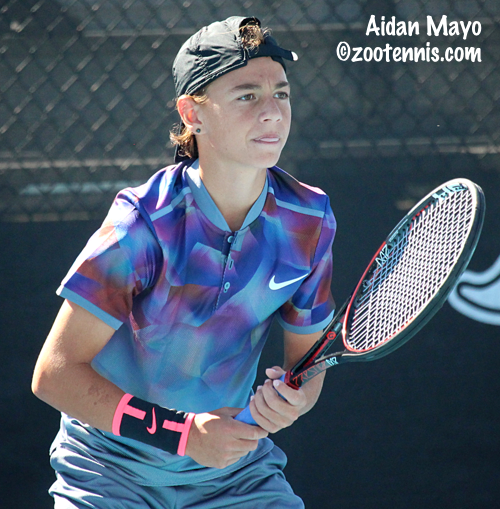 Acceptances for the ITF Grade A in Mexico City November 13-19 came out earlier this month, with 13 US boys and 15 US girls on the initial acceptance list. There are no boys in the ITF Top 25, with Sebastian Korda the highest ranking player on the list at No. 26. Other US boys in the main draw are: Sangeet Sridhar, Brian Shi, Axel Nefve, Tomas Kopczynski, Boris Kozlov, Nathan Han, Keenan Mayo, Drew Baird, Ronan Jachuck, William Woodall, Tyler Zink and Sumit Sakar. The boys main draw cutoff was Sakar, at 256. The girls field is stronger, with the cutoff 196, and the top five girls in the acceptances are all from the US: defending champion Taylor Johnson, Sofia Sewing, 2016 finalist Ellie Douglas, Natasha Subhash and Hurricane Tyra Black. Other US girls in the main draw are: Nicole Mossmer, Dalayna Hewitt, Lea Ma, Elli Mandlik, Sabina Dadaciu, Vanessa Ong, Alexa Noel, Kianah Motosono, Katya Townsend and Peyton Stearns. The acceptances for the Grade 1 Yucatan Cup and the Grade A Orange Bowl should be out next week. 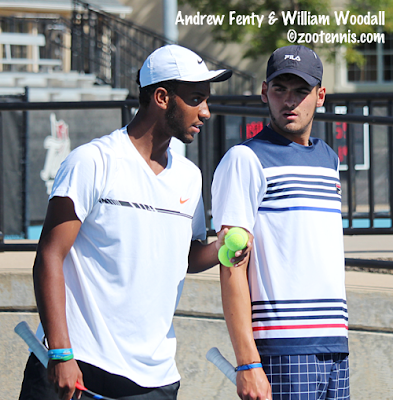 Today marks the conclusion of this year's coverage of the ITF Grade B1 Pan American Closed in Tulsa, with my written recap of Andrew Fenty and Whitney Osuigwe's titles available at the Tennis Recruiting Network. With their titles, Osuigwe moved to No. 1 in the ITF Junior rankings and Fenty rose to 33, which is his career high. The videos of the finals, which were played at the same time, are below, as are photos of the singles quarterfinalists and doubles semifinalists. The International Tennis Federation has been running a series on the 16 competitors for next week's Junior Masters in Chengdu China. 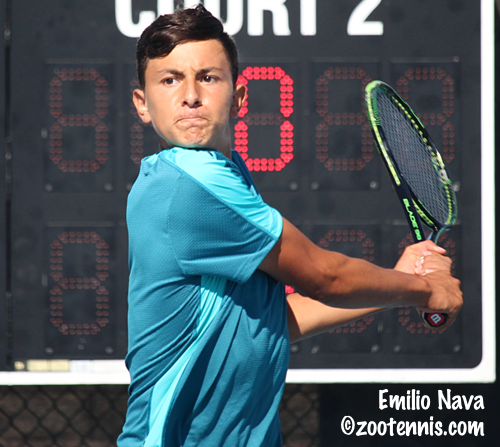 Each of the eight boys and eight girls will be profiled separately, with a detailed look at their best results in both junior and ITF Pro Circuit events. So far, two of the three US girls and the lone US boy have been profiled, with Sofia Sewing's article here, Taylor Johnson's article here, and Trent Bryde's article here. 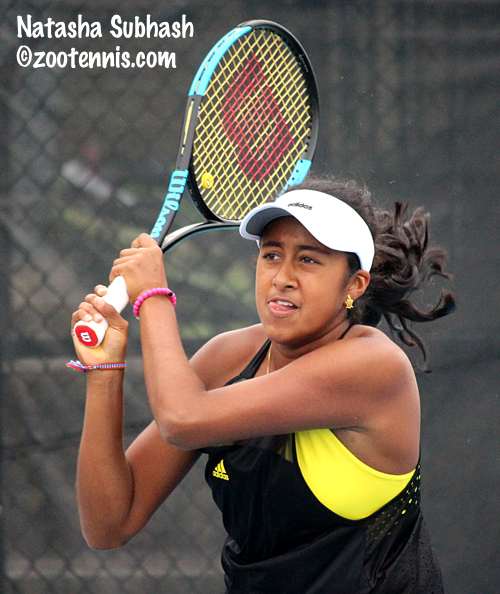 An article on Whitney Osuigwe, who is also playing the Junior Masters, has not yet appeared. Osuigwe is playing the ITF Grade A Mayor's Cup in Osaka Japan this week, as is Wang, but they are the only two in the draws, boys or girls, who are playing the Junior Masters beginning next Wednesday. Both have advanced to the round of 16, which will get underway soon. Osuigwe will face No. 16 seed Oona Orpana of Finland, and Wang will play No. 13 seed Viktoriia Dema of Ukraine. Americans Dalayna Hewitt and Hina Inoue lost their second round matches. 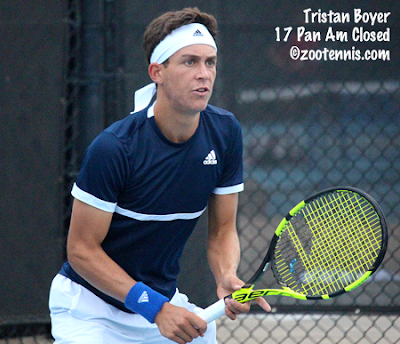 Sixteen-year-old Tristan Boyer, who like Osuigwe played the Pan American Closed last week, has advanced to the round of 16, his first third round appearance at a Grade A. He will meet unseeded Stefan Storch of Australia next. While 15 of 16 girls seeds advanced to the third round, only 10 of the 16 boys seeds did. Top seed Yuta Shimizu of Japan and No. 2 seed Timofey Skatov of Russia are among those 10 who advanced. US Open boys champion Wu Yibing of China will be playing the ITF Junior Masters next week after competing in the $125,000 ATP Challenger in Ningbo China. Wu, a wild card, lost in the first round to qualifier Jurij Rodionov of Austria, who also is in the Junior Masters field. Since winning the title in New York, Wu has received wild cards into a Challenger, which he won, then an ATP 250, the Shanghai Masters and this week's Challenger. He has not won a match in those three events, which may help keep the attention away from him. But becoming an ATP Top 100 player is Wu's goal, so he can expect to continue to receive more articles like this one from CNN, which explores why the Chinese women have been more successful than the Chinese men in breaking into the top levels of the pro game. The elimination of a Division I tennis program never comes at a good time, but the University of Evansville made a particularly poor choice in its decision to cut the women's program now, in the midst of the fall season. This leaves the players with few options as far as transferring, although their scholarships will be honored if they choose to stay. They just won't be able to play varsity tennis. For more on the decision to cut the program, see this article. Labels: College Tennis, International Tournaments, ITF Grade A Tournaments, Junior Profiles Non-U.S. The Division I ITA Regional Championships began last weekend, with five women's championships and two men's championships now in the books, with 17 remaining to be completed by next Monday. The winners receive automatic entry into the Oracle Fall Championships next month in Indian Wells. The results of the finals are below, with links to complete draws available at the ITA's webpage. 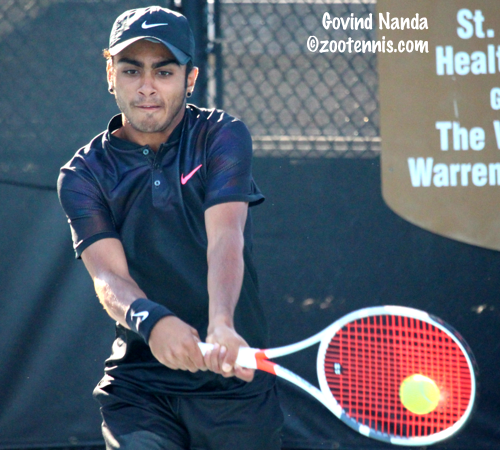 The USTA Pro Circuit has three events this week, with a $25,000 women's event in Florence South Carolina, a $25,000 men's Futures in Harlingen Texas and a $50,000 Challenger in Las Vegas Nevada. A complete rainout on Monday meant the women still in qualifying had to play two matches today, but the qualifying is now complete. Jada Robinson, Hanna Chang, and Sabrina Santamaria(USC) are the Americans through to the main draw, with former Alabama star Erin Routliffe of New Zealand also advancing. 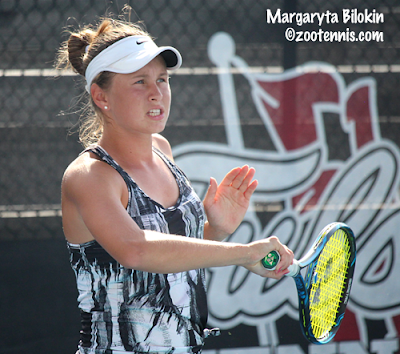 Five main draw matches were also played today, with Ohio State junior Francesca Di Lorenzo beating No. 2 seed Anna Karolina Schmiedlova of Slovakia 2-6, 6-3, 6-4. The 23-year-old Schmiedlova, now 163, has been as high as 26 in the WTA rankings, but struggled to win matches on the tour last year and has been playing on the ITF Pro Circuit this year. Taylor Townsend, last week's champion in Sumter, is the top seed and will face Wimbledon finalist Ann Li, a wild card, in the first round Wednesday. The first round is complete in Las Vegas, with nine American men through to the second round: Tennys Sandgren, Stefan Kozlov, Kevin King, Marcos Giron, Michael Mmoh, Bradley Klahn, Evan King, Reilly Opelka and qualifier Jared Hiltzik. Great Britain's Cameron Norrie, who took last week off after winning two consecutive $100,000 Challengers in Northern California, is the No. 2 seed. Fairfield Challenger champion Mackenzie McDonald withdrew with a hamstring injury. In Harlingen, former Ole Miss star Nik Scholtz of South Africa is the No. 1 seed, with No. 2 seed Dennis Nevolo(Illinois) already through to the second round with a 6-2, 6-0 win over wild card DJ Thomas. Ohio State sophomore JJ Wolf, another wild card, also advanced as did Illinois senior Aron Hiltzik and No. 7 seed Ulises Blanch. 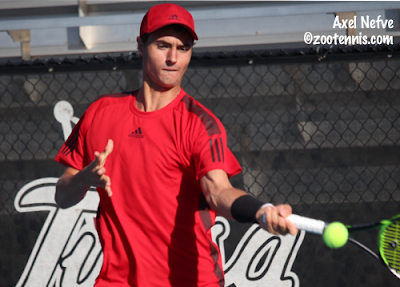 Texas A&M senior Jordi Arconada received a wild card and Sebastian Korda, a finalist last week in Houston, received a special exemption into the main draw. 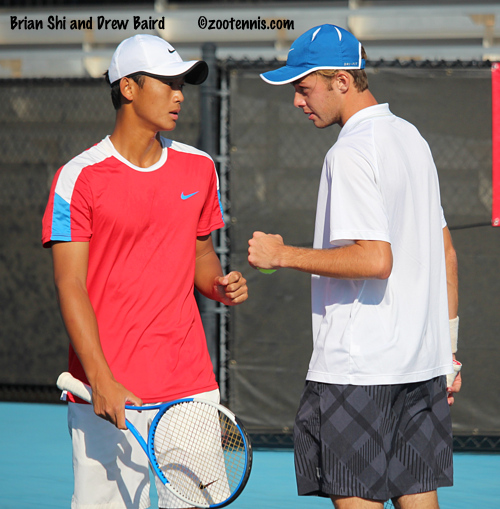 They, like unseeded Houston champion Thai Kwiatkowski, play their first round matches Wednesday.